It closed up today and the week so it’s following through the big shoot up the other day. As we can see that on the daily chart, it’s in short-term over bought condition now. 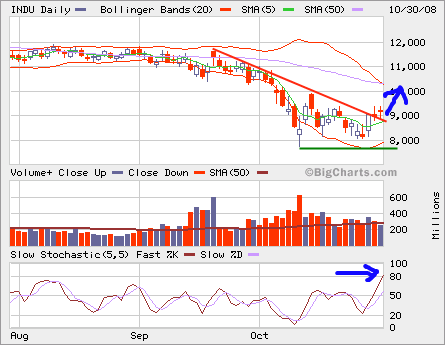 It’s slowly walking out the downtrend line, but we should be cautious as the volume was not confirming. If you have significant equity positions in your portfolio, any rally into 9,500-10,000 zone can be your opportunity to lighten up and preserve your capital during this bear market. All major markets rocket back over 10% today. A lot of short squeezes probably. I don’t believe that there’re so many longs that couldn’t wait and jump on the buying spree. On the monthly chart of Dow Jones Industrial Average (INDU), you can see that we’re approaching previous low, which occured 5 years ago. Have we reached the bottom yet? 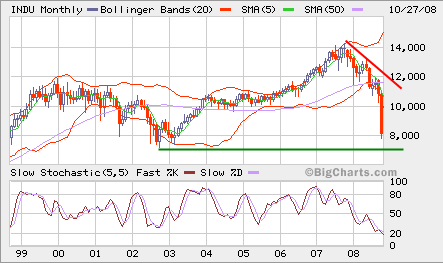 Not sure, but we might be near the bottom judging by the previous low, which is the current support level. The looming global recession is on everyone’s mind, so it’s possible that the support may not hold. There will be many ups and downs around that support. 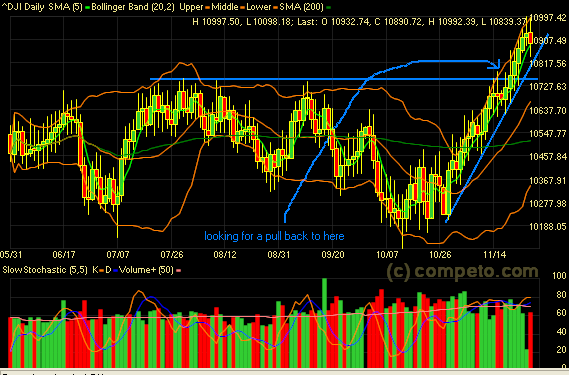 We can certainly play longs at the support level and shorts at any rally near 9,500/10,000 zone. The markets are currently in oversold condition and volatility will remain high as seen in the past a few weeks. 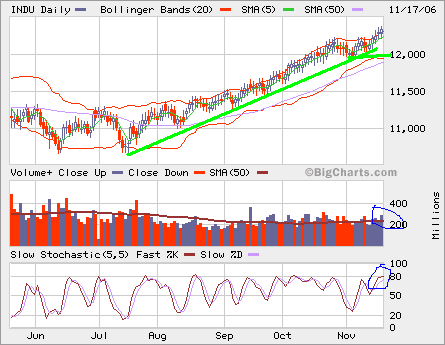 On the 3-month daily chart, INDU is moving away from the oversold condition. If we don’t see a follow through on this snap back, the downward trend will continue. 8,000 looks like a good support for now and the more fight between the bears and bulls around 8,000 the stronger it will become. 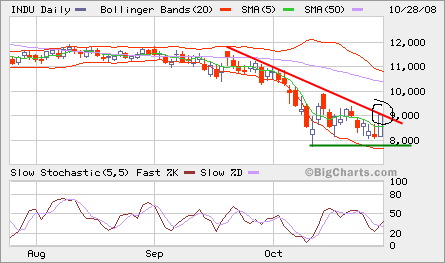 If the downtrend continues, 7,500 is the next major support to watch. 12,000 is at the rear mirror now. INDU has been strong in the past two weeks. Even though it’s in over-bought territory, INDU has the momentum to reach higher at year end rally. The mid-term election was over, the market did not over-react to the new political landscape in Washington. DOW Jones Industral Average pulls back a little. I expect that we may see a pullback around 10730. If you are bullish, it may be an opportunity to get on this rally at the year end. How much will the market continue to rally? All major markets are quite extended after going straight up for almost two months. It’s quite possible that it continues to move up, but I would sell into the strength to take some profits.